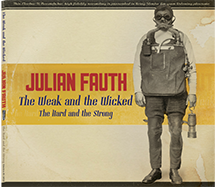 Julian Fauth is a singer and piano player whose style is based on the tradition of pre-war barrelhouse blues and boogie woogie, with infusions of gospel and jazz. He writes his own songs in addition to re-interpreting traditional material. In his teens, Julian was a protégé of Mississippi blues giant Mel Brown, whose influence was invaluable. He plays regularly in his hometown of Toronto and has toured across Canada, the USA, Western Europe, Russia and Cuba. Julian has recorded a number of CD’s with Electro-Fi Records. His first CD, “Songs of Vice and Sorrow” was nominated for, and his second CD “Ramblin’ Son” won, the JUNO for Blues Album of the Year. His third CD was selected Best Blues Album of 2012 by the CBC, he’s won one Maple Blues Award and been nominated for many other MBA’s. Julian has played with many great players and has opened for Johnny Winter, John Mayall and John Hammond. so be sure to “LIKE” and follow us on there as well. The Senator Winebar, located in the heart of downtown Toronto, has officially chosen JUNO Award Winning blues musician Julian Fauth, as the resident piano player Friday nights from 9PM – 12AM. Julian will be featuring many talented special guests on a regular basis throughout his residency. We hope to see you all there in the coming weeks and months.